Using card with black symbols, researchers trained honeybees to understand that sugar water would always be located under a card with the least number of symbols — including when presented with a card that was totally blank. Honeybees understand that "nothing" can be "something" that has numerical meaning, showing that they have a primitive grasp of the concept of zero. 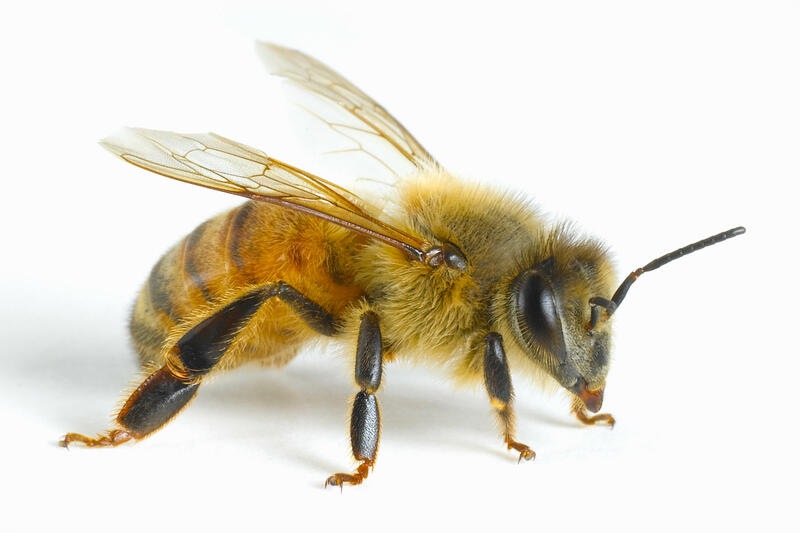 That's according to a newly published study in Science, which shows that bees possess a mathematical ability once thought to exist only in dolphins, primates, birds and humans who are beyond the preschool years. He says zero was discovered relatively recently in human history, and was essential in the development of both mathematics and science. "It's a hard and very abstract concept," Nieder says. "It is a sort of eccentric uncle in the number family." Previous experiments have shown that honeybees have some facility with numbers, because they were able to count landmarks as they foraged around for a sweet reward. But in these tests, the insects couldn't count very high — only to about four. Still, that made a team of researchers in Australia and France want to explore what else the bees could do with numbers. Scarlett Howard at RMIT University in Melbourne, Australia, lured bees to a wall where they were presented with two square cards. Each card had a different number of black symbols, such as dots or triangles. Howard trained one group of bees to understand that sugar water would always be located under the card with the least number of symbols. "They could come and see two circles versus three circles, or four triangles versus one triangle, or something like that," she explains. The bees quickly learned to fly to the card with the fewest symbols, an impressive feat. But then they got another test: The researchers presented the bees with a card that had a single symbol — and a blank card that had nothing on it. The bees seemed to understand that "zero" was less than one, because they flew toward the blank card more often than you'd expect if they were choosing at random — although they weren't that good at distinguishing between the two. It got easier for them when they had to compare zero with a larger number. "When we showed them zero versus six, they did that at a much higher level than zero versus one," Howard says. "So what tells us is that they consider zero as an actual quantity along the number line. They're actually better at doing zero versus six because those two numbers are further apart." "We were very surprised and happy, excited, to see that actually the bees were choosing the empty paper," says Aurore Avargues-Weber, a CNRS researcher with the University of Toulouse. Even very young children, she points out, have trouble understanding that zero is a number. "It's easy for them to count 'one, two, three, four,' but zero, it's nothing, it's not something to count. So it's not the same category," she explains. She had expected that the bees would see a blank paper as something irrelevant that was completely different than what they had been trained on, because to understand zero, "brains need to represent something out of nothing. It's not trivial." What's more, the brains of bees are incredibly tiny brains compared with the brains of humans, Nieder notes. "Bees really have a mini-brain with fewer than one million brain cells," he says, "compared to 86 billion nerve cells in our brain." Even so, the bees can understand the abstract concept of an empty set — the precursor or prerequisite to understanding the symbolic number zero — and he says he found that very surprising. Zero is a number that isn't easy to understand. Only humans, primates, dolphins and some birds get the concept of zero - or at least that's what scientists used to think. NPR's Nell Greenfieldboyce reports that another creature can do math with zero. And it's the honeybee. NELL GREENFIELDBOYCE, BYLINE: Honeybees are tiny but talented. They have to explore to find food, sometimes flying more than 2 miles, and then find their way back to the hive. Scientists have done experiments showing that the bees can keep track of landmarks by counting. SCARLETT HOWARD: Bees could count up to four landmarks to find a place to forage. GREENFIELDBOYCE: Scarlett Howard is a researcher at RMIT University in Melbourne, Australia. She wanted to know what other numerical skills bees might have. HOWARD: And one of the big ones that jumped out at us was to see if they could learn some numerical rules and then apply that to zero. GREENFIELDBOYCE: Zero is special and weird. Preschool children struggle to wrap their minds around it. To see how bees would handle zero, Howard lured them to a wall where they were presented with two square cards. Each card had a different number of black symbols, such as circles or triangles. HOWARD: They could come and see two circles versus three circles or four triangles versus one triangle or something like that. GREENFIELDBOYCE: She trained bees to understand that sugar water would always be located under the card with the least number of symbols. She says the bees would hover in front of the cards, inspecting them. HOWARD: And it's quite amazing to watch such a small-brained animal do something so complex and actually look like it's trying to work out a problem. GREENFIELDBOYCE: After the bees had learned to go for the smaller number, Howard presented the bees with two cards. One card had one symbol on it. And the other card was completely blank. Howard watched to see what the bees would do. HOWARD: So I guess I was excited, but I wasn't holding my breath for any results like the one we got. GREENFIELDBOYCE: The bees seemed to understand that zero was less than one because they flew toward the blank card more often than you'd expect if they were choosing at random, although they weren't that good at distinguishing between the two. It got easier for them when they had to compare zero with a larger number. HOWARD: What that tells us is that they consider zero as an actual quantity along the number line. They're actually better at doing zero versus six because those two numbers are further apart. GREENFIELDBOYCE: Other experiments, described in the journal Science, offer additional evidence that bees get the basic idea of zero. And that surprised Andreas Nieder. ANDREAS NIEDER: This is quite amazing in my view that bees can really do it. GREENFIELDBOYCE: He's a scientist at the University of Tubingen in Germany who studies how animals process the idea of nothing. He says zero is so quirky and strange, it's hard for humans. NIEDER: We take longer to process zero. And for some adults, it remains a mysterious number. For instance, when asked whether it's an odd or an even number, people struggle with this. GREENFIELDBOYCE: And yet bees somehow manage to have a primitive grasp of zero. Nell Greenfieldboyce, NPR News. (SOUNDBITE OF VIA LUNA'S "ASTRAL PLAINS") Transcript provided by NPR, Copyright NPR.